Commuters at the Coast will pay more to use Public Service Vehicles and tuk tuks as operators have hiked fares due to the fuel tax. Industry players say the new fares will remain for six months, when a review will be done, as they cannot operate on losses. For short distance tuk tuk users, the price has doubled from Sh50. Town service fares have increased by Sh10 while the costs of inter-county services hiked by Sh50 in Kilifi and Mombasa counties. The lowest fare is Sh30, up from Sh20, which was for short stage-to-stage distances. The fare from Tudor-Ferry/Docks is now Sh40, from Sh30, same as the cost of moving from Tudor-Labour. To be transported from Magongo-Ferry/Docks, Migadini-Ferry/Docks, Port Reitz/Jomvu-Mwembe Tayari and Mikindani-Ferry/Docks, commuters will now pay Sh70, from Sh60. The fare from Miritini to Mwembe Tayari is now Sh80, Bamburi to Kengeleni Lights Sh40, Bamburi to Ferry/Docks/King'orani Sh70 and Mshomoroni-Mwembe Tayari Sh60. Kwale residents suffered the most, according to Matatu Owners Association (MOA) Treasurer Gakuya Hassan, who said the charges are 30 per cent higher. Mr Mohammed Musa, the Secretary General of the Tuk tuk Owners and Drivers Association (TODA), said fares were hiked as they had been making losses. 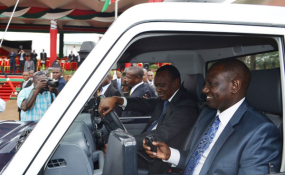 Mr Musa said the vehicles, which are commonly used in the tourism hub, have been operating on a standard rate of Sh50 for short distances since 2002. Some operators within the central business district have already doubled the cost to Sh100. "We will have to declare the new prices for tuk tuks," he said. While announcing the higher town and inter-county service fares, the MOA said the increments had gone up to 16 per cent. National Vice Chairman Ali Bates said passengers will pay the price as their hands are tied and they can't operate on losses. "The new fares will not drop regardless of what President Uhuru Kenyatta does about the fuel tax imposed on September 1," Mombasa county chair Said Mabruk said at their office in Mombasa after a meeting with industry players. Kilifi, Tana River and Lamu coordinators said they haD persevered - while making losses - for long and that they also considered the costs of spare parts, insurance and mechanics..